Healthy zucchini cookies that are both and delicious and good for you with banana, oats, flax, coconut oil, coconut sugar, and (of course) zucchini. This is the cookie recipe that will make you feel good about eating cookies. Even though you can’t taste it, these healthy zucchini cookies have veggies in them (!!) and loads of other wholesome ingredients. They’re sweet enough to get your sweet tooth fix but only have 5.7 grams of sugar. Now that I’ve officially ruined that christmas cookie platter you received from your neighbor Pam, let’s talk about sugar for a minute. These healthy zucchini cookies use coconut sugar instead of white sugar. Coconut sugar is the dehydrated sap from coconut trees. Its less processed, maintains more nutrients, and is slightly lower on the glycemic index than regular sugar. Before you jump for joy and rush to Costco for the biggest tub of coconut sugar you can find, I’m going to burst your bubble just one more time… sugar is sugar folks. Pam don’t give a sh*t about what kind of sugar she uses, and for special occasions, you shouldn’t either! Sure, coconut sugar, maple syrup, honey, and other natural sweeteners might be slightly more healthy and are certainly better for every day use, but at the end of the day, sugar is not good for any of us and must be eaten in moderation. Just because a form of sugar becomes the new hippy dippy craze of the moment does not mean you should start inhaling it like its a health food, because it isn’t. It is just a little bit better for you than the alternative. Numerous studies have been done that clearly associate high sugar intake with cancer and various other diseases. I heard somewhere a few weeks ago that sugar is the smoking of our day. Yikes. I love gummy bears like no other, but I also care enough about my future to know that I can’t eat them every day. That being said, its important to treat yourself on occasion. This is the Christmas season and depraving yourself of all things unhealthy just isn’t realistic. Assuming you’re reading this because we’re like minded individuals, this isn’t the life any of us want to live. No lie, I probably eat almost a dozen Christmas cookies every year. I don’t feel bad about this at all. I enjoy all of my seasonal favorites, but I don’t do this every day and make sure to sandwich healthy meals and snacks in between. January is right around the corner and I don’t want to be one of those, “New Year, New Me” meme posters that make your eyes roll so hard they nearly get stuck in the back of your sockets. Just keep it real folks. Treat yo-self… but don’t go nuts. One way I do this is with healthy swaps. To my point earlier, Christmas or not, I still shouldn’t be eating cookies every day. I could get away with making a batch of these cookies once a week though and still have room for a piece of chocolate cake on when on occasion. With only 5.7 grams of sugar, even eating two of these cookies would still give me less of a sugar rush than most oatmeal packets or yogurts you’ll find at the store.They have about 3 grams of protein per cookie so not crazy high, but nothing to be scoffed at. I ate three of these for breakfast yesterday and am munching on one with coffee right now. Just the notion of eating cookies for breakfast makes me do a happy dance. If you’re anything like me on this, healthy zucchini cookies will be a breakfast winner in your house too. If zucchini is still too scary for you, try these oatmeal breakfast cookies or these chocolate coconut cookies instead. Due to the high moisture content, I definitely recommend pressing each cookie down to flatten it before baking. Otherwise you’ll end up with round cookies. The roundness traps more moisture inside which mean they won’t last as long. If you’re making holiday cookie platters and want to keep it clean, I’ve got a few candy / cookie recipes that you won’t want to miss. These coconut chocolate balls are out of this world. You can either drizzle the chocolate on top (my fav) or completely dunk them (husband’s fav). They’re soooo good! Cookies or no cookies, I hope your holiday season is going fabulously so far. It snowed in Portland yesterday so the whole city shut down (as usual) and we all got sent home from work early. Not a bad Thursday if you ask me. Either way, TGIF – happy Friday friends! Who doesn’t like an excuse to eat cookies? Combine flour, oats, cinnamon, baking soda, and salt and stir to mix. In a separate bowl, beat banana. Add coconut oil, sugar, vanilla, and egg and beat with hand mixer. Pour wet ingredients into dry ingredients and mix with hand mixer until just combined. Don’t over mix! Prepare a baking sheet by either lining it with parchment paper or spraying with cooking spray. Roll dough into 1-inch balls. 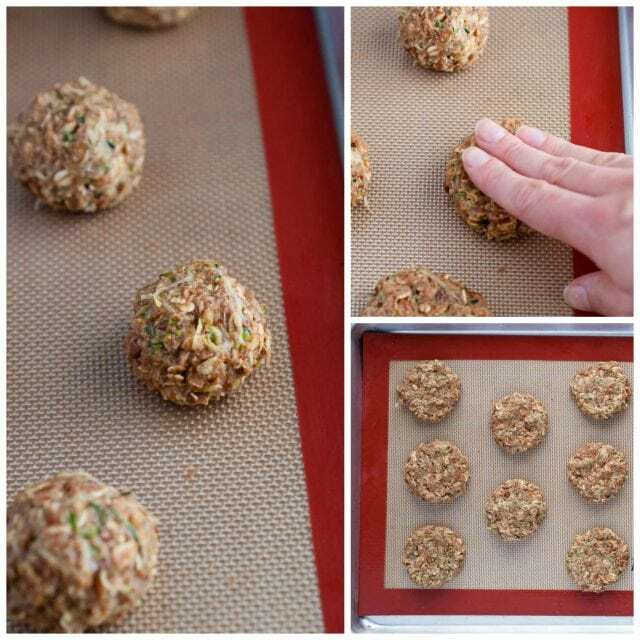 Place rolled balls onto baking sheet with at least an inch of space between them. Flatten to about ½ inch thick with fingers. Bake for 12 – 13 minutes until edges are starting to brown lightly. Let cool on baking sheet for 10 – 15 minutes. Cool fully on a cooling rack before storing in an airtight container. Cookies will keep for about three days. What a great healthy cookie alternative from the regular sugary cookies (which I love as well). I do like the idea of eating these cookies for breakfast! Are these cookies crunchy or chewy?